Final update of April diary. Another week where a major challenge was to decide whether to leave a sweater on or take it off. When the sun was shining it was quite hot and summery but as soon as it disappeared behind a cloud the temperature chilled and it was back on with the sweater. Things in the garden are moving on at a fair pace now with changes noticeable from morning to later afternoon. Attempting to beat the dreaded carrot fly. Unfortunately carrot flies thrive in moist and mild climates – just like ours and our countryside provides many wild plants, such as cow parsley, which the carrot fly is attracted to. Problems with carrot fly larvae can discourage gardeners from even trying to grow carrots. Click here to read how we attempt to control the beasts! Although the greenery says spring , winter is still challenging the idea and sending some cold winds. When the sun pushes through it is lovely and warm. It’s the sort of weather that the plants and wild life must find confusing. We had a hedgehog trogging around the garden during the day this week. As hedgehogs are nocturnal it can be a sign that they are unwell but this one looked sprightly enough. I think he just fancied coming out when it was warm and who can blame him! (or her). Arriving home after yesterday's visit to the plot we noticed that we had picked up a stowaway. 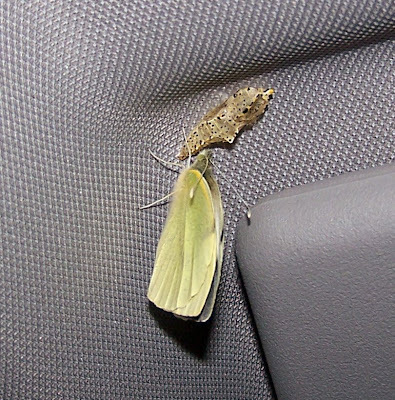 At some point a cabbage white caterpillar must have found its way into our car and spun a chrysalis on the roof. Yesterday an adult butterfly emerged which was the first time that we had noticed it. I'm not sure it wanted to leave the warmth of the car but I removed it and placed it on some flowers in the garden. No brassicas in the garden for its caterpillars to devastate. Has anyone else found wildlife in strange places? Sadly today was the funeral of Harry Easter. 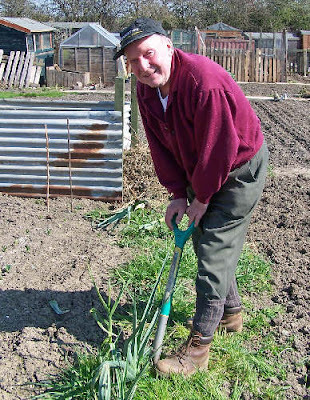 Harry, who suddenly died last week, was one of the longest standing plot holders on Green Lane. He first started on his plot over 40 years ago. Then about three years ago a full sized plot proved a bit too much for him to handle and so he downsized to half a plot. Finally, last year, he reluctantly had to quit his plot completely but was still a regular visitor to the site. Harry was a pit deputy by occupation. He was a great character who not only loved gardening and his bowling but also enjoyed a good chat with fellow plot holders. He was always cheerful and had a smile on his face. He never complained whatever difficulties he faced. Our sympathies to Harry's wife Grace, his 6 children, 12 grandchildren and 1 great grand child. Harry will be missed! The Pesticide Safety Directorate has undergone reorganisation and from 1 April 2009 is known as the Chemicals Regulations Directorate. Click here for their website. Following on from the contaminated manure problems of last year - the CRD have published a postcard giving advice on the use of manure. Click here to download. Remember that it is still very possible that contaminated manure is still in the supply chain so great care should be taken when obtaining manure. If you are a member of an organisation and would like to obtain copies of the postcard for distribution , there is information on how to obtain a free supply of postcards click here. It’s really beginning to look and feel like spring now. I think from now until the end of May is my favourite time of the year when the greens look so fresh and everything seems just bursting to grow. This includes the dandelions that look good mingling with the daisies on roadside verges but not so good on the plot. One minute they have been mown down and the very next moment have sprung back up again and are in full flower. We have had some very pleasant days on the plot. Our heat treated onion sets arrived. We bought a red variety – Red Baron, a white variety – White Prince and a yellow variety – Fen Globe. We have also started to plant our potatoes using the trowel method, some Juliette and Belle de Fontenay. I have also weeded around the raspberry canes that are growing strongly now. We dug up all the remaining carrots that we overwintered in the ground. Some were still good enough to harvest. For the full diary entry click here. I was also asked this week what happened with regard to the medlars picked last year. I have to admit – not much. I’m not sure whether we picked them too soon or whether they were small due to it being the tree’s first year but in short there wasn’t enough fruit to really have a good taste and decide what we thought of them. We really bought the tree for its decorative qualities so any fruit, especially if it proves palatable, will be a bonus. We use sets from which to grow our onions and shallots. Onions can be raised from seed but are more prone to problems and do not do as well on poor soil. The process also takes longer to produce a mature onion. Growing shallots from seed is fairly uncommon. Last year for the first time we tried heat treated onion sets. 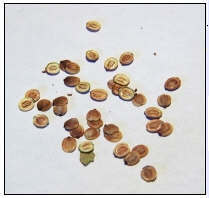 These are treated to cut down the chance of the plant bolting and producing a flower stem. The heat treated sets are more expensive but did perform better than those that were not treated and so this year that is all that we are planting. Heat treated sets should be planted slightly late than other sets i.e. late March to Early April. Onion sets are smaller than shallot sets. An onion set is an immature onion which was grown from a seed the previous year. It will grow and form one onion, whereas a shallot set splits and forms a cluster of several shallots. We also planted both onion and shallot sets last year to overwinter which will give us an earlier crop. The ones planted this spring will be good for storing over next winter. 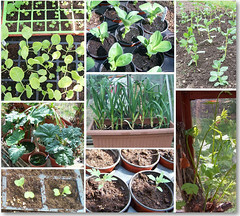 Click here to read how we go about planting the sets. Parts of this week have tempted us into thinking that the thick sweaters can be packed away but then we have been brought back to reality with some very windy days when it has felt quite chilly. The plum and greengages, on our plot, are loaded with blossom so it is left to fate to decide whether the frost that has been apparent on some mornings will put paid to what promises to be a good crop of fruit. This week not only have we weeded and rotavated on the plots but have actually got down to sowing seed, namely parsnip – Gladiator - and planting shallot sets – Topper and Piquant - so the season feels to have really started. 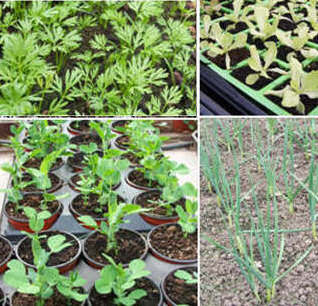 The garlic plants – Solent Wight - that were started off in pots in the greenhouse have now been planted out. Most of our vegetable plants are raised in the greenhouse so seeds are sown in pots and trays rather than straight into open ground. 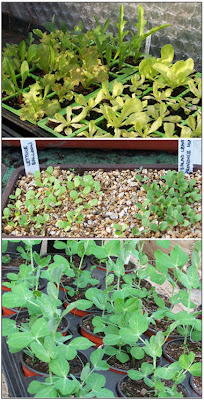 Some have been given a kick start in an electric propagator kept in a spare bedroom and are transferred to our cold greenhouse as soon as they have germinated. To read the complete diary entry click here. Parsnip seed does not keep well and so it is recommended that new seed is purchased each year to increase the chance of good germination. Parsnips are in the ground for a long time - we are still harvesting parsnips sown last year, so this should be kept in mind when choosing a location for sowing. We leave our parsnips in the ground until we are ready to eat them. The flavour of the roots improve after they have been subjected to a frost as the frost turns the starch into sugars. Most advice is to plant very early but there is no point in doing this if the ground is cold and wet as the seed will rot and so not germinate in these conditions. Parsnip seeds are notoriously slow to germinate and some people prefer to pre-germinate them on damp kitchen paper but touch wood we have generally had reasonable success using the method explained here.